In The Shadow of Greatness — The Intelligence Community Inc.
Their stories needed to be told. And classmates working together, under a blanket of trust and friendship, was the only way to allow people to open up. It was a three year journey into the hearts and souls of America’s youngest heroes to gather these important historical accounts, but it was worth every hour spent. Inside this book are the voices the first Annapolis graduates into a decade of war and they remind us that America is in good hands. They were walking to class on 9/11, wearing Naval Academy “summer working blues”, when the towers were struck. The campus went to general quarters, battle stations. They would be the first class after this attack to graduate into a nation at war and would be faced, like so many past graduates, of rising to the challenge to keeping America great. President Bush and Vice President Cheney articulated a world at the crossroads, and the U.S. would preemptively in seek enemies who threatened the national interest, America would not again be terrorized. 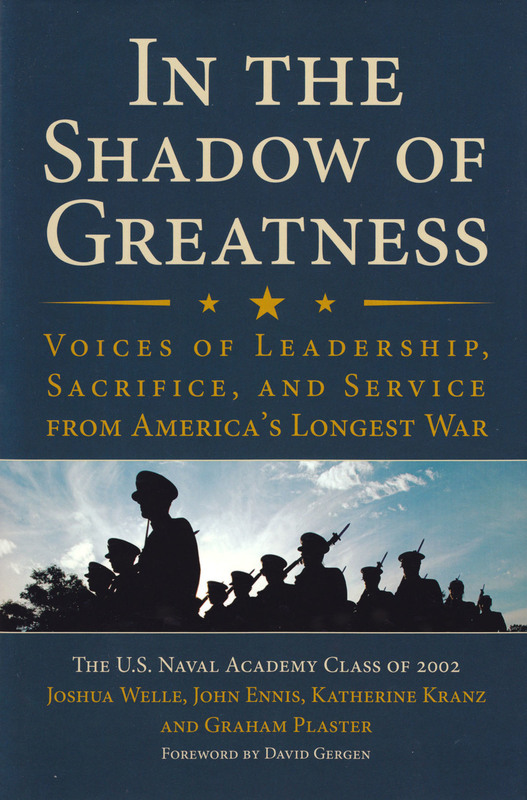 In the Shadow of Greatness addresses issues that go beyond one USNA class, it explains the trials of most military veterans of this era. Understanding how a young person enlists to serve, deploys to the fight, and returns home is unknown to most Americans. Veterans pack up their uniforms, but never lose the call for service when the return to civilian society. The profiles in this book represent the “Next Great Generation” of American leaders. Men and women who lost their innocence in battle and their youths to a decade of deployments, throughout which they never gave up hope. In exchange for down range scars, they gained an unbreakable sense of purpose to America’s ideals—freedom, equality, and democracy. The compilation is the most authentic and raw narrative to emerge from the Wars in Iraq, Afghanistan, and beyond. The reader enjoys a spectrum of stories, each patriotic and honorable. The narratives are meant to inspire, educate, and reveal a world many don’t understand. Its contents are readable and easy to appreciate. The Class of 2002—and more broadly, the one million veterans of the Long War—are America’s leaders of tomorrow. Read this book to learn what they endured and why they are prepared.